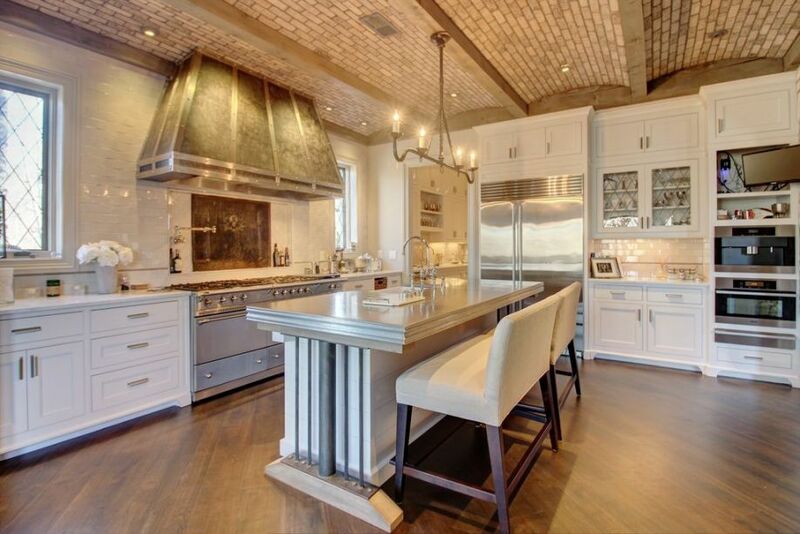 Could French country decor get any better than this outstanding open concept kitchen and living area -- I think not. 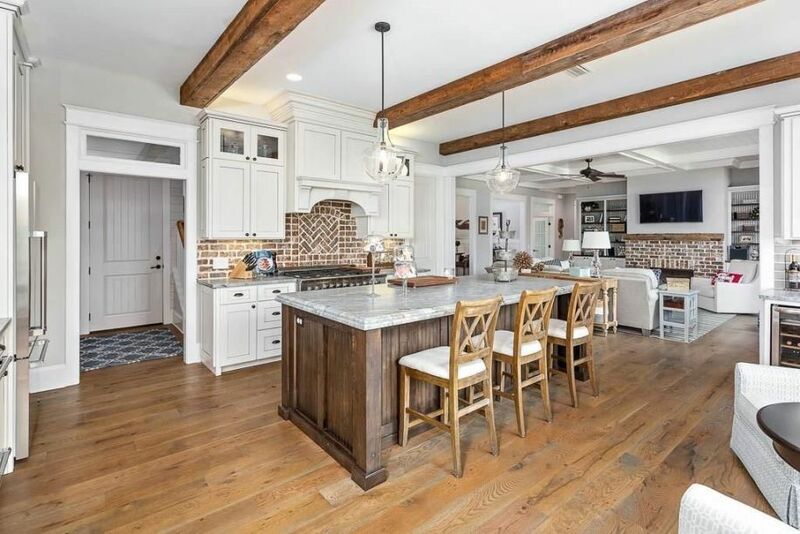 From the stunning ship lap covered walls and ceiling, to the gorgeous natural finish cabinetry that matches the exposed wood beams, everything in this space coordinates absolutely perfectly. Somehow the designer managed to make the space look rustic and modern at the same time, in a way that would appeal to both lovers of traditional style decor as well as those that prefer a more modern and industrial feel. I think that the key to this design is mismatching colors and styles to keep the eye guessing. The kitchen island is done in a traditional white shaker style cabinets base with beautiful granite countertops, while the rest of the units took on the same ashy sheen as the beams and vaulted ceiling. French country kitchen decor does not have to be rustic, it can be just as glamorous and high end as any other design style. This decor theme is inspired by the gorgeous homes of the Provence region of France, and incorporates lavish feminine detailing such as plush ruffled textiles, mixed patterns, and vibrant color palettes along more rustic detailing like distressed woodwork and old world charm. A French kitchen is actually quite versatile and pairs well when many architectural and decor styles whether they be quite traditional or even more contemporary. This luxe space is an example of how you can do this decor palette in a very luxurious way. 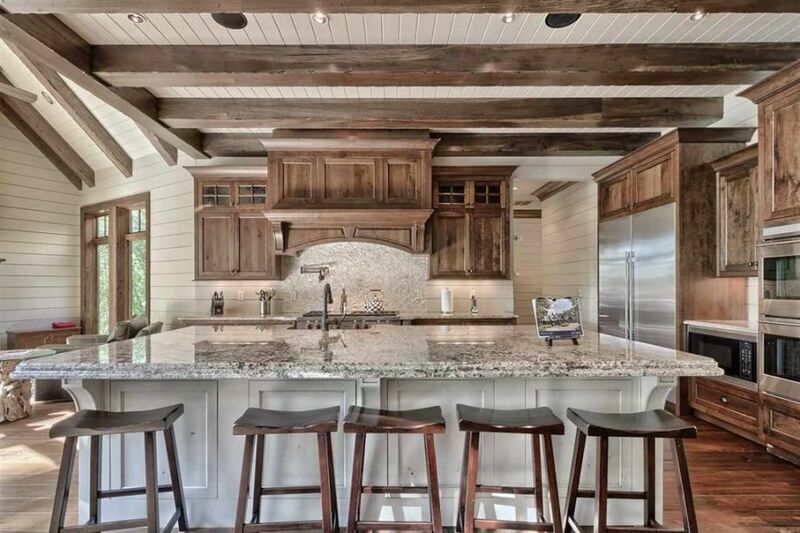 I have always been drawn to kitchen decor that has a homey country twist, whether that be through classic pine cabinets, wood beams on the ceiling, or even a brick hearth. All of those things make a space exceptionally cozy and remind me of the years of family time we spent gathered around the kitchen table. Now that it is time for me to design my own kitchen that will be in our forever home, I have been on the look out for country kitchen ideas that will help me to replicate that same feeling in the new space. I especially loved this white kitchen because it is the perfect blends of homey rustic touches against more refined contemporary decor. For those of you who have been asking for advice on how to create a country style kitchen that still works in today's modern world and contemporary design trends, look no further than this fantastic space we just finished up. If I had to give one tip, it would be to use a French country kitchen as very basic style inspiration, but do not fully commit to the design or else you may end up with a cliche space that is not at all in line with what you originally envisioned. For example, as I was reviewing kitchen design ideas with this client, she mentioned that she loves rustic pieces that remind her of a country farm house but that she also enjoys all of the luxurious amenities we have today. If you love country decor but are too afraid to commit to such a bold style in your house, take a look at this gorgeous open concept living area decorated in a modern yet rustic theme. 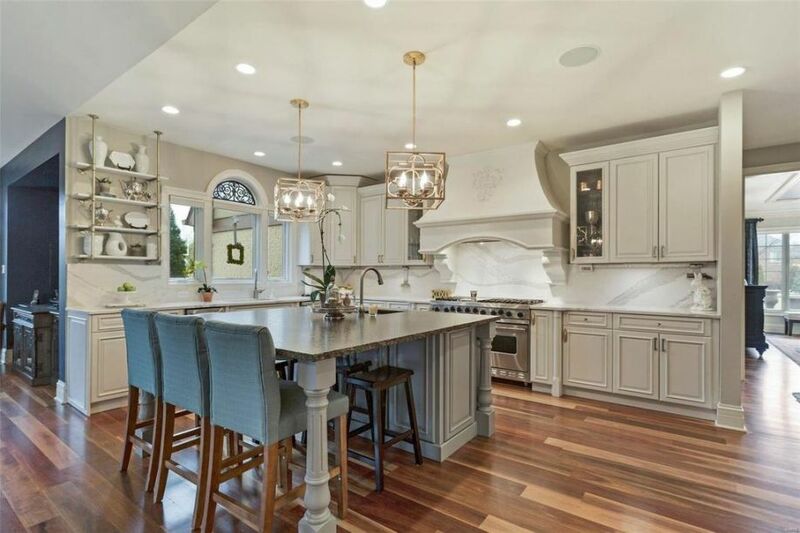 If I am going to do a French country kitchen or den, I generally like to lean on the elegant side of that decor style so that the space can appeal to a wide audience of potential buyers. I also tend to limit the defining "country" elements to things that can be easily removed like artwork, furniture and textiles, and keep the more permanent features quite neutral. 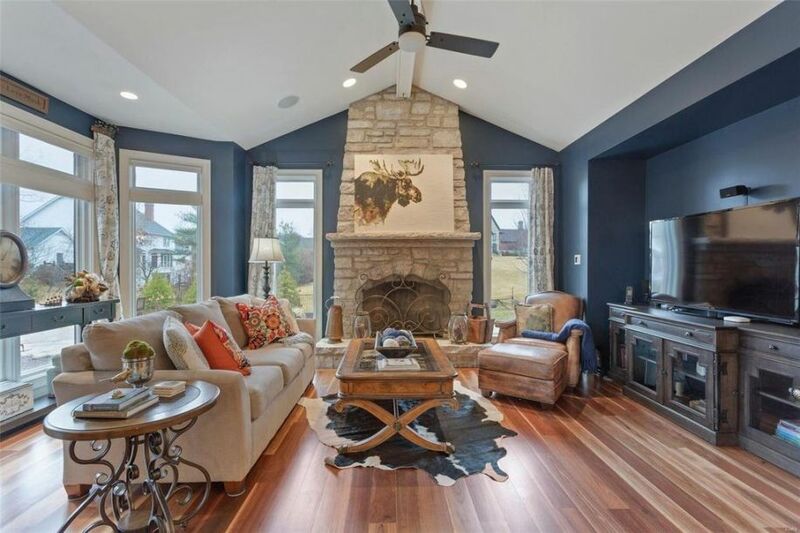 Of course there are some elements of French decor that cannot be missed such as a large stone fireplace like the one we added in this home, or vaulted ceilings and beautiful plank flooring. I love this unique contemporary twist on country kitchen decor and wish that I could take credit for the design! I viewed this gorgeous space as part of a parade of homes in my city and was so inspired by the pairing of rustic elements like exposed beams, classic shaker cabinets with jute basket drawers, and natural brick ceiling, alongside modern pieces like a stainless steal kitchen countertops, large decorative tin hood, and industrial accents in the fixtures.